Cut ends off Brussel sprouts and cut in half. Peel and cut sweet potato in 1″ cubes. 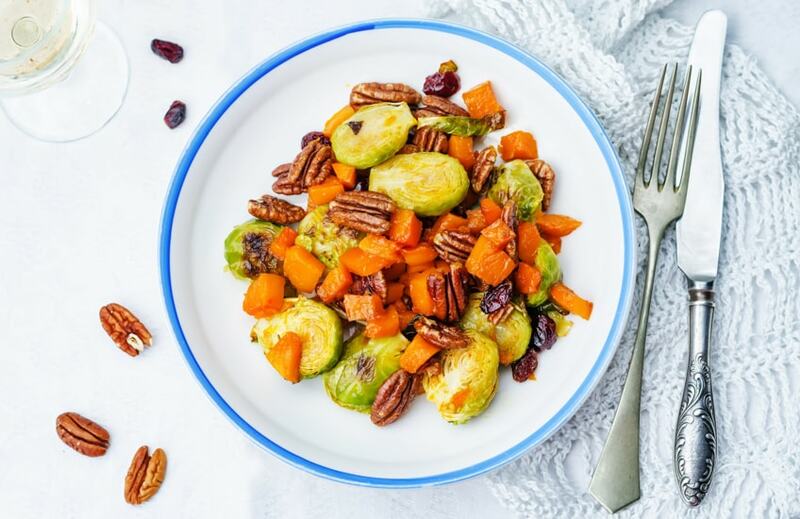 Place sprouts and sweet potatoes on a baking sheet and pour olive oil on top. Add in pecans and mix until coated evenly. Roast for 30-35 minutes, until crisp on the outside and tender on the inside. While Brussel sprouts are in the oven, combine balsamic vinegar and sugar in a saucepan. Bring to boil, then reduce heat to medium-low. Cook until glaze is thick and syrupy, about 20 minutes. Drizzle the balsamic reduction over the roasted sprouts. Top with dried cranberries. Want more healthy Thanksgiving inspiration? Here’s what we’ll be cooking up this week.